Jessie (right) and her house-mate, Tim. At Friendship House, after the evening meal is finished and the dishes washed, we gather around the kitchen table for prayer. Lighting a candle, we sit in silence and the presence of God, reflecting on the day. Someone offers a prayer for the hungry, the homeless; another prays in silence. The stillness brings us together after the bustle of the day, and in our shared silence my heart speaks its gratitude: I am home. Ten months ago, I came to L’Arche Chicago as a live-in assistant at Friendship House. I had no idea who I would live with or how my life would change; I only knew that I felt called to embrace this faith-based community of adults with and without disabilities who share life together and serve as a sign of God’s love in the world. In 2010, while working at the Pentagon in Washington, D.C. as a civilian defense policy advisor, I read Jean Vanier’s book Becoming Human, and learned how he founded L’Arche in 1964 with two men who had intellectual disabilities. I had rarely encountered anyone with an intellectual disability in my life, and his book opened my eyes to a new way of living my Christian faith with those who are often ignored and overlooked in society. 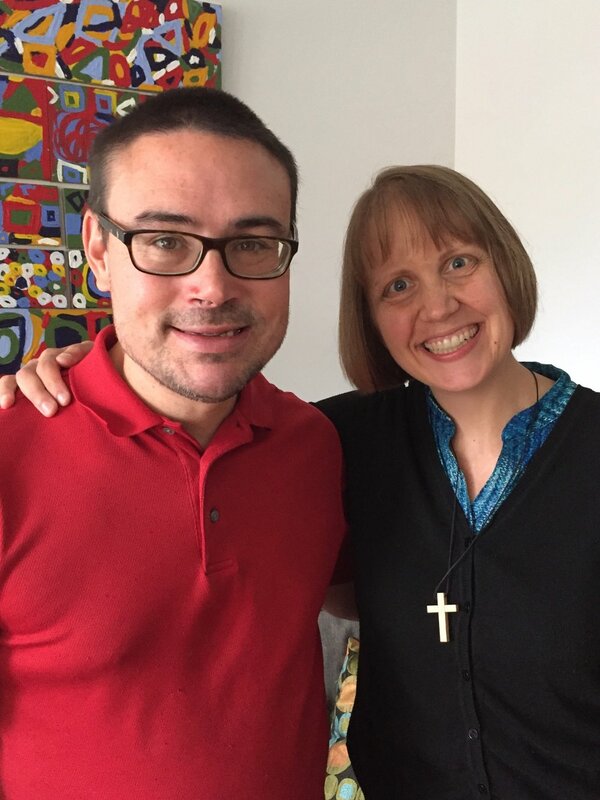 In 2017, I left the Pentagon to pursue a religious vocation in the Episcopal Church, and in 2018, during yet another period of transition, my heart was stirred to look at L’Arche Chicago as a community where I might find a home. Little did I know how my life would change! Spending time with the core members at Friendship House – Elbert, Tim, and Chris – and other assistants may involve laughter, tears, or even tickling. At the Pentagon, my life was filled with meetings and travel in support of senior government leaders; it was exciting to be at the heart of world events but also stressful and exhausting. At L’Arche, I revel in the simple daily activities of life: walking our dog Allie with Elbert, enjoying coffee at a local café with Tim, going on “ride drives” around the neighborhood with Chris, listening to the blues with Tim and Elbert on Saturday night. Each day, I am reminded of how lucky I am to be in relationship with people who value me and each other for who we are, flaws and all. The truth is, living in L’Arche can be hard. There are days when I want to run away from the difficult conversations, moments of tension or fatigue. Being in relationship with core members who have challenging physical or emotional needs has revealed to me how often I hide my own neediness and vulnerability. I don’t always know how to help; sometimes I can’t do anything but simply be present. And I also see how I fail to love as Jesus did – with compassion, trust, and unselfish love. It’s good to remember everyone has grumpy days sometimes, core members and assistants alike! During my time at L’Arche, I have learned to appreciate the slow rhythm of days: of quiet mornings spent knitting while Tim meditates, or playing pool with Elbert on a rainy evening. I am grateful also to live in a faith community where prayer and God form the heart of our community. While living at L’Arche, I have appreciated support from core members and assistants as I have discerned about becoming Catholic and pursuing a vocation as a Poor Clare nun. The beauty of L’Arche is that each person’s life journey is honored and celebrated as surely as each person is valued, respected, and loved simply for being who they are. Core members are often the first to show welcome – through a clasped hand, a pat on the shoulder or a kind word – and their trust and generosity in turns calls me to open my heart and keep showing up, even when it’s hard. In a world where success is often defined by money, power, or fame, L’Arche is a sign that another way is possible: the way of vulnerability, humility, self-giving love and forgiveness. Day by day, core members and other assistants teach me how to live in mutuality – how to be with someone without trying to fix them, how to give and receive friendship, how to accept others’ flaws as they accept mine. I don’t know what the future holds, but wherever I may go, L’Arche will remain with me as the place where I found home.